In the Western countries, upper lid reconstruction is often performed following excision of skin tumours in particular basal cell carcinoma. In our centre, most upper lid reconstruction is performed for unsatisfactory repair of eyelid trauma. Most of these cases were performed by non-ophthalmologists or ophthalmologists who have insufficient understanding of the unique features of the eyelid skin. We present two cases who have poor cosmetic and functional results following initial repairs. Figure 1. Unsatisfactory left ocular appearance. with misalignment of the upper lid margin. This young man was assaulted with a sword. He sustained a left full thickness eyelid laceration of the upper and lower lids as well as the globe. The eyelid laceration was repaired by a junior ophthalmologist. He later underwent evisceration because of painful blind eye and a prosthetic eye was inserted. The patient was unhappy with his appearance. Examination revealed poor cosmesis with cicatricial ectropion and poor alignment of the upper eyelid margin. The prosthetic eye also appeared too big for his orbit. a. How can the appearance be improved? Figure 3. Appearance of the left eye 4 days after the initial repair. Figure 4. Appearance of the left eye two months after the initial repair. Figure 5. Poor eyelid closure due to skin shortage and cicatricial ectropion. A 22-year-old female backseat passenger sustained multiple facial cuts from broken windscreen during a road traffic accident. She was admitted to the orthopaedic ward for observation and the left eye was patched without ophthalmic consultation as her vision was normal. She was seen three days later for her facial lacerations. The eyelid was found to be necrotic with glasses embedded in the wound. The wound was debrided and the skin was sutured and shortage of skin was noted (Figure 3). 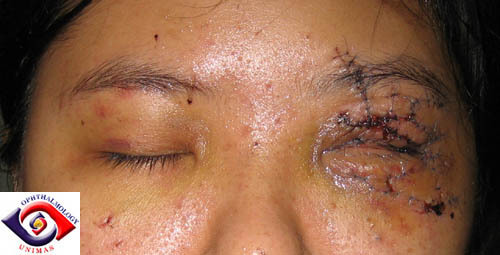 Although the patient was able to close her left eye initially, the contracture of the scar tissues resulted in eyelid retraction and lagophthalmos (Figure 4 and 5). b. How could this have been avoided and how would you manage her problem?